On Dec. 21, 2015, SpaceX made its eagerly awaited return to flight by launching an upgraded Falcon 9 rocket from Florida. The launch placed eleven Orbcomm commsats into low Earth orbit and, in an historic first, successfully landed the first stage of the Falcon-9 back on Earth. The mission’s success is a triumph for SpaceX and an event as epochal as the 1969 Moon landing or SpaceshipOne’s Ansari X-Prize victory in 2004. The dawn of reusable rockets promises to drastically cut the cost of spaceflight and usher in a new age of human space exploration. SpaceX CEO Elon Musk during the December 21st, 2015, "ORBCOMM-2 Full Launch Webcast." the eleven satellites carried on the upgraded Falcon-9 were deployed approximately 20 minutes after liftoff, completing a 17-satellite, low Earth orbit constellation for Orbcomm. Screenshot c/o SpaceX. The Orbcomm mission is now the jewel in SpaceX’s crown of successes, which include being the first private firm granted a $2.6Bln USD ($3.6Bln CDN) NASA contract to ferry crew and cargo to the International Space Station (ISS), and being certified by the US Air Force as a launch provider for military satellites (breaking a monopoly held by United Launch Alliance). The mission was all the more triumphant coming as it did six months after a Falcon 9 exploded during flight due to a failed strut in the rocket's upper stage liquid oxygen tank. SpaceX has faced many challenges in the thirteen years since its founding. These include public skepticism, hostility from the traditional US space industry and its political allies, anti-NewSpace factions within NASA and the US military and various other financial and technical troubles. SpaceX CEO Elon Musk and his team overcame each of these obstacles in turn through persistence, creativity and sheer skill. The little-rocket-company-that-nobody-thought-could, now lies at the heart of an industrial empire poised to reshape not only our world, but many others. This still from a 2011 SpaceX mission concept video shows a Dragon space capsule landing on the surface of Mars. More recent concept art focuses on the 2013 Red Dragon Mars lander design. Graphic c/o SpaceX. With the advent of reusable rocketry, a long-cherished dream now seems within grasp. As astronomer Carl Sagan stated in his landmark 1980 television series "Cosmos: A Personal Voyage:"
We have lingered long enough on the shores of the cosmic ocean. We are ready at last to set sail for the stars. It's well known that lawmakers, entrepreneurs and advocates are often the real facilitators of science and exploration. With that in mind, here are some of the high and low points for the Canadian space sector in 2015. Lego Chris says hi! Photo c/o http://minifigs.me. The year started out on a positive note with the exchange of gifts. As outlined in the January 10th Yahoo News UK article, "Astronauts Get Their Own LEGO Minifigures on Space Station," LEGO mini-figures customized to look like expedition 43 astronauts Terry Virts, Samantha Cristoforetti and cosmonaut Anton Shkaplerov were given as gifts by the real expedition 43 astronauts to each other on New Year's Day. The toys were part of an ongoing sales campaign created by UK-based company Minifigs.me. 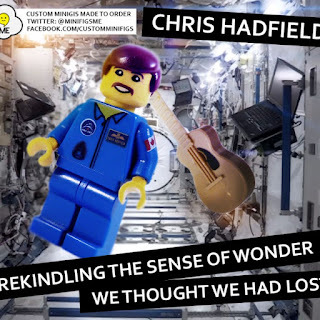 As outlined in the September 2nd, 2015 CBC News article, "Denmark's 1st person in space brings along 20 Lego astronauts," the little rectangular creations have often been used to promote space science, the space program and increased sales for the Lego Group, the giant Danish family-owned company best known for the manufacture of Lego brand toys. So everything must have been awesome, especially in Canada where, as outlined in the January 27th, 2015 post, “Canadian Space Company UrtheCast is Hiring," Vancouver BC. based UrtheCast, our fastest growing space company, announced plans to open a second office in Vancouver to house up to 40 new hires specializing in video, GIS, web development and space systems technologies. In June, as outlined in the June 22nd, 2015 post, "Is UrtheCast Becoming Canada's "Other" Space Program?," the company announced an audacious plan to "build, launch and operate the world’s first fully-integrated, multi-spectral optical and synthetic aperture radar (SAR) commercial constellation of Earth observation satellites." Only a week later, in an obvious reminder that even moderately sized Canadian corporations were now able to fund space activities using the commercial market, UrtheCast acquired Deimos Imaging, along with its two existing satellites (Deimos-1 and Deimos-2), to begin the process. Canada also fared well from the historical perspective. Beginning with the February 27th, 2015 post, "Part: 100 Years of Aerospace History in Canada: From McCurdy to Hadfield," historian Robert Godwin put Canadian aerospace history under a microscope to and found it chock full of the very same eccentric millionaires, driven geniuses and all around crazy people we normally only associate with the US. In an echo of the situation today, some of those historical characters even ended up in the US, after starting out in Canada. Beginning with the July 20th, 2015 post, "Part 1 of The Empire Strikes Out - Canada's Defence & The Commonwealth Space Program," Godwin (who is also the owner and founder of Apogee Space Books and the space curator at the Canadian Air & Space Museum) turned his attention to how the "general confusion during the late 1950s about the merits of missile defence led to several questionable strategic decisions made by the Governments of Canada and the United Kingdom." Come fall, and as outlined in the October 4th, 2015 post, "Rocket Spaceflight Accurately Described by Scottish-Canadian Scientist in 1861," Godwin made the case that the fifth principal of Queens University in Ontario, Presbyterian minister William Leitch (1814-1864), was the first trained scientist to have applied scientific principles to accurately describe the rocket as the best device for travelling in space. But things are never perfect, especially from a political perspective. As outlined in the February 9th, 2015 post "NASA Will Buy More Soyuz Seats for US, Canadian, European & Japanese Astronauts," the western space agencies hedged their bets to insure future access to the ISS, just in case those new rides to orbit from Boeing (the CST-100) and SpaceX (the Dragon V2) weren't ready for their expected late 2017 roll-out dates. Trust the Federal government under prime minister Stephen Harper to want to rock the boat. The February 17th, 2015 post, "Taking Sides Via Satellite: Ukraine to Receive RADARSAT-2 Images" was only the latest salvo in the ongoing politicization and militarization of the high frontier. Of course, the Harper government might have had a point. As outlined in the February 23rd, 2015 post, "The Growing Military Importance of Earth Imaging," even UrtheCast has a former director of the US National Geospatial-Intelligence Agency on its board of directors. In essence, Earth imaging technology has become a "must have" capability for technocrats and the military. And sometimes, even the government manages to make the right decision. As outlined in the March 9th, 2015 post, “Magellan & U of Manitoba Open New Satellite Manufacturing Facility,” the new Advanced Satellite Integration Facility (ASIF) in Winnipeg, MB., a joint venture between the University of Manitoba (UofM) and RADARSAT Constellation (RCM) bus manufacturer Magellan Aerospace, will support research, development, construction and testing of satellites and their components. Even after a few initial challenges, life was getting better for most Canadian space companies. 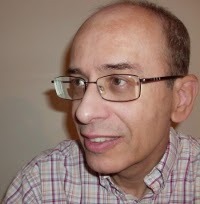 For example, as outlined in the April 13th, 2015 post, "The MOST Space Telescope Joins the Private Sector," it looked like "curtains" for the plucky Microvariability and Oscillation of STars (MOST) micro-satellite in April 2014 when the Canadian Space Agency (CSA) announced that funding would be withdrawn as of September 9th 2014. 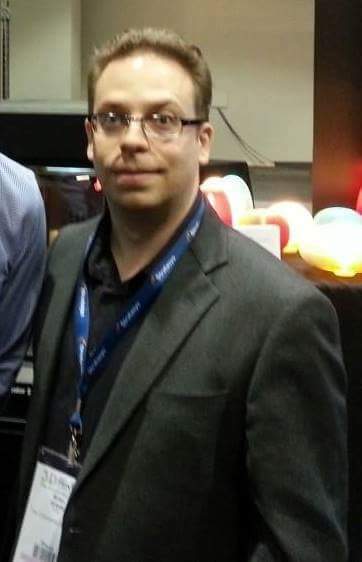 But by October 2014 it was back in operation under the watchful eyes of longtime UBC professor and MOST principal investigator Jaymie Matthews, in partnership with satellite operator Microsat Systems Canada Inc. (MSCI) and making enough money to be able to maintain operations as a successful small business. The 2015 article, written for the Commercial Space blog by Ross Gillett, the director of micro-satellite programs at MSCI, was an excellent reminder of what small private companies can do, if given the opportunity. 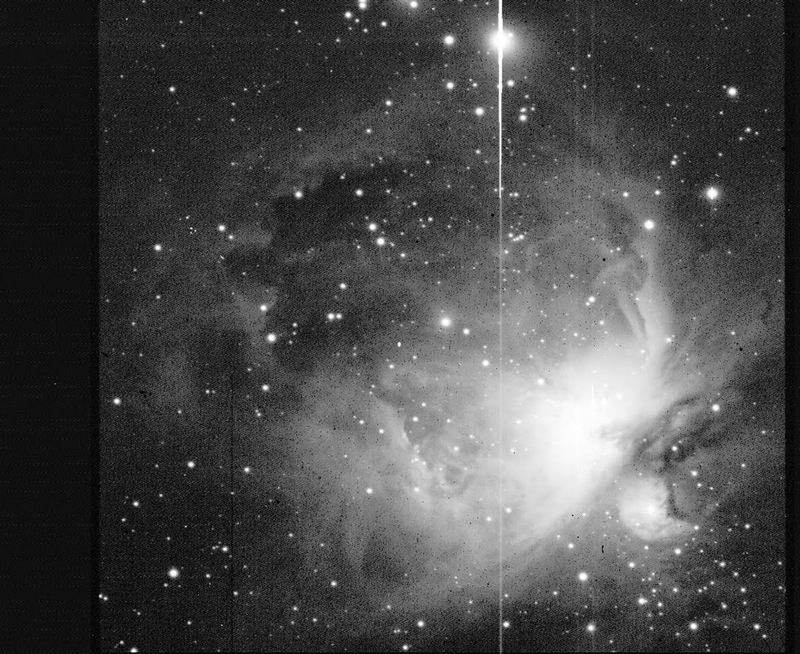 "Raw" low-res NEOSSat image of Orion Nebula, taken in early 2015. NEOSSat is a Canadian micro-satellite which uses a 15 cm aperture f/5.88 Maksutov telescope similar to the one used on the MOST spacecraft. It's stabilized on 3-axis and has a pointing stability of ~2 arc seconds in a ~100 second exposure. Image c/o CSA. A better example of what small private companies can do, even when faced with government intransigence, is the Near-Earth Object Surveillance Satellite (NEOSSat), another MSCI built and managed satellite. As outlined in the April 20th, 2015 post, "Four NEOSSat Images in Search of Respect," a series of images taken by NEOSSat in early 2015 provided a strong indication that initial difficulties relating to the roll out of the satellite during the 2013 - 2014 period were finally being overcome. Initially, and like all large government bureaucracies, the CSA didn't want to retract their earlier public comments, which were outlined in the July 7th, 2014 post, "NEOSSat Not Up to the Job; Government Report Blames Contractor." But the publication of the four NEOSSat images in the Commercial Space blog allowed MSCI to go public with their concerns and independently confirm that the Canadian satellite was operating as advertised and able to complete its mission. Which is a good thing, for the country and MSCI, and even for the CSA and the humble little news service you are currently reading. An exactEarth promotional video released in 2013 in order to provide an overview of its ability to "monitor all global shipping" with its exactEarth ShipView™ tool. The company, a subsidiary of Cambridge, Ontario based COM DEV International, made the news several times during the year. As outlined in the July 5th, 2015 post, "The REAL Story Behind the Upcoming (Maybe) exactEarth IPO," the initial plan was to spin off the company as a separate entity from COM DEV, but that didn't work. Later, as outlined in the November 7th, 2015 post, "Should the proposed COM DEV sale to US based Honeywell trigger the Investment Canada Act?," exactEarth was included as part of a deal with US based Honeywell International, which needed to keep the cost of its offer to purchase COM DEV under $600Mln CDN in order to avoid an automatic Federal government review. And finally, as outlined in the November 29th, 2015 post, "exactEarth’s Big Bet on The Internet of Things," the company offered up its vision of the future, assuming the Honeywell deal goes through. To paraphrase Harry M. Stevens, you can no longer track a space company without a proper business scorecard. Graphic c/o exactEarth. Of course, there are always a few who aren't pleased with the way things are. Chief among the disgruntled was Richmond BC based MacDonald Dettwiler (MDA) CEO Dan Friedmann, who was initially quoted on his concerns in the March 2nd, 2015 post, "Will the Last MDA Employee Leaving the Country, Please Turn out the Lights." According to Friedmann, while MDA was benefiting from a "surging" international demand for Earth observation satellites and data, "none of that business is coming from Canada and the company is currently transferring resources out of the country to follow the market." MDA CEO Friedmann reconciling contradictory views. Photo c/o Ideacity. 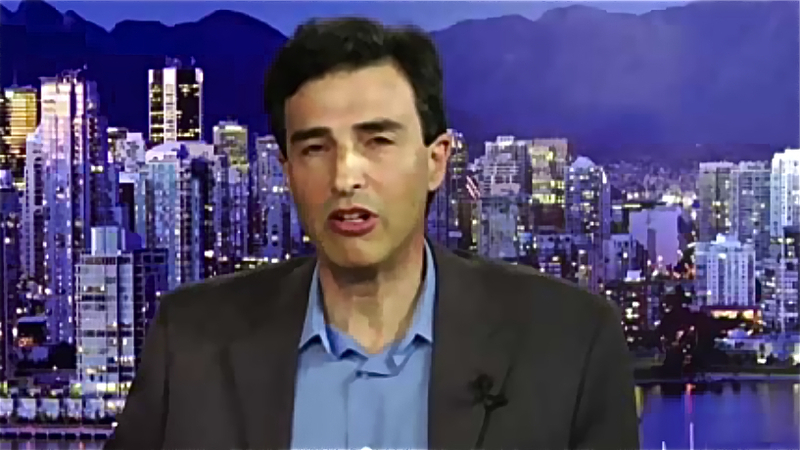 By May, as outlined in the May 12th, 2015 post, "MacDonald Dettwiler, Sherlock Holmes and Why "Daddy" Might not Love Either," his big beef was a lack of new space robotics contracts in Canada, a situation which Friedmann said had essentially forced MDA to seek new business in the US, Europe and Asia. But by November, Friedmann had changed his tune. Why the change in tune? Part of the reason could be the smell of an expected payday accruing from contracts related to the planned Polar Communication and Weather (PCW) mission, an estimated $600Mln CDN chunk of Federal government change, which is expected to be issued in 2016. But another reason could simply have been the dislike of the Harper government policies relating to "capacity building," a policy designed to maintain existing infrastructure for items like space robotics, even in the absence of new demand. The US equivalency of this activity is the space launch system (SLS), a brand new space shuttle-derived expendable launch vehicle being built using 40 year old components and technology, just in case NASA might ever need to use antiques again. Under their previous Jean Chrétien incarnation, capacity building was well understood and often practiced within the Liberal party, although in a way often confused with cronyism. 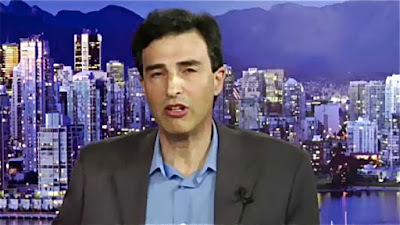 There is also little doubt that Friedmann personally remembers the time, as recently as 2008 when, as outlined in the April 17th, 2015 post, "Part 11: 100 Years of Aerospace History in Canada: From McCurdy to Hadfield," his company was being allocated almost half of the annual CSA budget, with contracts worth $430Mln CDN. 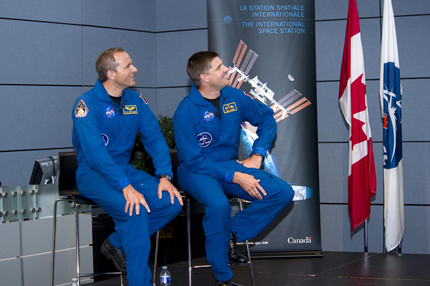 CSA astronauts David Saint-Jacques (left) and Jeremy Hansen, who didn't go to space in 2015, but did attend a lot of interesting activities and hosted a number of educational events. The Stephen Harper government spent much of 2015 using its ability to fund science and technology programs through the CSA and Industry Canada (now "Innovation, Science and Economic Development") in an attempt to do something which could easily be confused with buying re-election. Articles such as the May 25th, 2015 post, "Getting out the Space Vote For a Fall Election," the June 1st, 2015 post, "Goodyear Announces $13.1Mln in New Funding; Moore to Announce More Canadians in Space," and the July 28th, 2015 post, "'Up to $18.4Mln' More for the Downsview Aerospace Hub" were typical of the coverage in this area. For those looking for a contrary view, there was the June 25th, 2015 post, "Jobu Won’t Save Your Space Start-up: Do it Yourself," among others. Photo c/o CSA. But to be fair, there were probably more than just a few people who didn't like the way things were going, at least as they related to the Harper government. The October 25th, 2015 post, "A New Government and Renewed Hope for the Canadian Space Industry," discussed the October 19th, 2015 Federal election and noted that the new Liberal government, led by incoming Canadian prime minister Justin Trudeau, will make the decisions about the direction the Federal component of the Canadian space industry will take. It also asked about the direction the new Liberal government would like to take. As outlined in the November 22nd, 2015 post, "Two New Government Players Looking to Prove their Usefulness," any repudiation of the 2012 Emerson Aerospace Review, or even minor changes in policy, aren't likely to happen anytime soon. Some changes have taken place with the change in government. Seen above is newly minted Innovation Minister Navdeep Bains at a press conference on Parliament Hill on November 6th. As outlined in the November 6th, 2015 Huffington Post article, "Liberals Unmuzzle Canadian Scientists, Promise They Can Now 'Speak Freely,'" he was fulfilling a Liberal party campaign promise to allow government scientists and experts to comment on their work to the media and the public. Of course, the real test of this new policy will occur sometime in 2016, when some currently unknown Federal government employee attempts to talk about something which conflicts with Liberal government policy. Photo c/o Adrian Wyld/CP. To be fair to the previous attempt to be fair, and as outlined in the July 24th, 2015 post, "Space Economy Now $330Bln US Annually, Says Report," the industry, pretty much everywhere outside of Canada, has become a worldwide powerhouse, poised on "the cusp of a new era of rapid expansion in both capabilities and customers," after a decade of steady (but lower) annual growth which averaged around 7%. And, as outlined in the December 21st, 2015 Verge article, "SpaceX successfully landed its Falcon 9 rocket after launching it to space," the rest of the world is beginning to catch on to the possibilities inherent in our next upcoming space age. But traditional government and academic based science activities haven't done so well. An example of this would be the Canadian Space Conference, a CSA organized event which, as outlined in the December 13th, 2015 post, "The Canadian Space Conference: When Will It Be Loved?" has been suffering from a degree of neglect. A second example would be the Thirty Meter Telescope, which has been temporarily halted as outlined in the December 6th, 2015 post, "Hawaii Supreme Court Rescinds Permit to Build Thirty Meter Telescope." So what's going to happen next year in space for Canada? 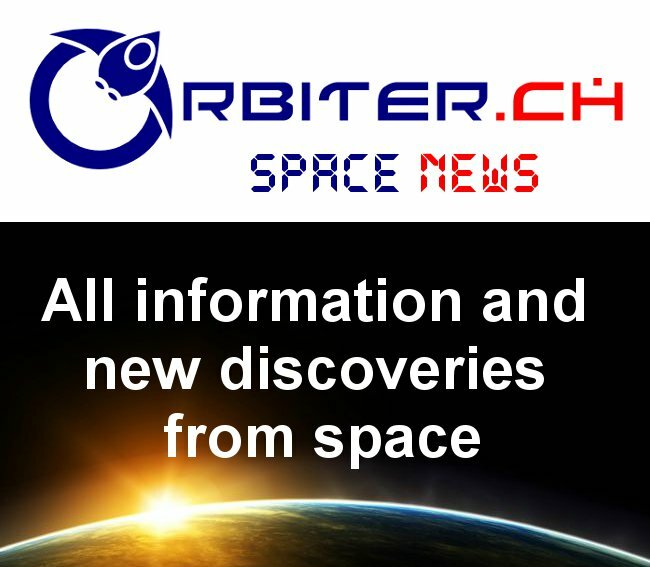 Find out beginning January 5th, 2016, when the Commercial Space blog returns with all new stories. British astronaut Timothy Peake became the first British citizen to reach the International Space Station (ISS) on Tuesday and the UK government is using the event to highlight its plan for a distinctly private sector space program. On Sunday, the British government released its first national space policy, a slim, fifteen page document which, among other things, sets the goal of growing UK private space activities into a £40Bln ($83.2Bln CDN) annual industry by 2030 from its current 2014 estimates of £11.8Bln ($24.54Bln CDN). The policy is also intended to grow the UK space workforce from 35,000 workers to 100,000 over the next 15 years. Major Peake, shown here during training, launched on a Soyuz TMA-19M spacecraft from the Baikonur Cosmodrome in Kazakhstan on Tuesday as part of the expedition 46 "Principia Mission," along with US astronaut Tim Kopra and Russian commander Yuri Malenchenko on a six-hour trip to the ISS. 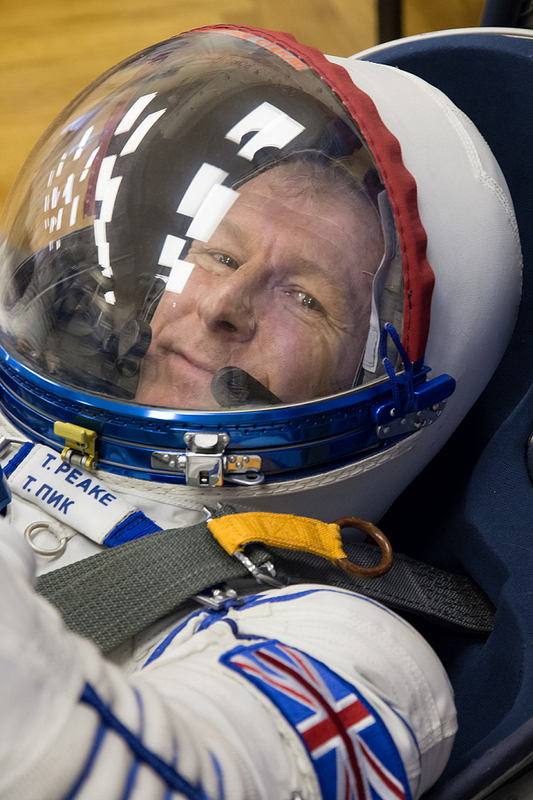 As outlined in the December 14th, 2015 Telegraph post, "Tim Peake's launch into space will inspire a generation, says scientist," the British public would be unlikely to know much about the latest mission had a British astronaut not been on board. Photo c/o Victor Zelentsov. Surrey Satellite Technology Ltd. manufactures satellites and payloads, Inmarsat Plc delivers mobile satellite communications for broadband, machine-to-machine and maritime safety. Avanti Communications Group has its own fleet of satellites providing coverage to Europe, the Middle East and Africa. Airbus Defense & Space has nine facilities in the U.K. The government has also invested in growth sectors and tech incubators like the Satellite Applications Catapult and the UK Space Gateway in Harwell. But the UK space industry thinks there is an opportunity to get even bigger. According to the new report, space has become increasingly important to modern Britain and needed to be cultivated. British private sector astronaut Helen Sharman, who traveled on board Soyuz TM-12 with commander Anatoly Artsebarsky and flight engineer Sergei Krikalyov, to the MIR space station in 1991. Graphic c/o Daniel Space Collecting. 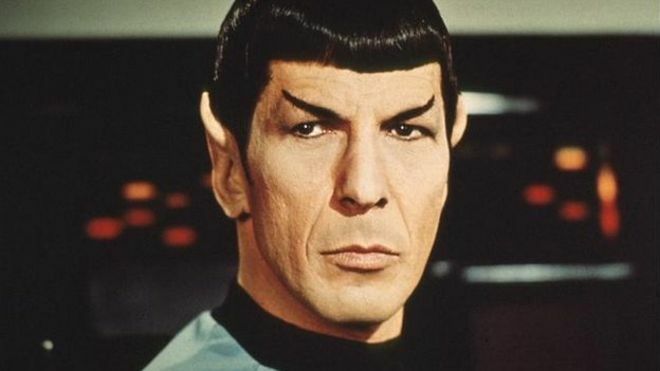 Of course, Peake isn't the only UK astronaut to go into space. 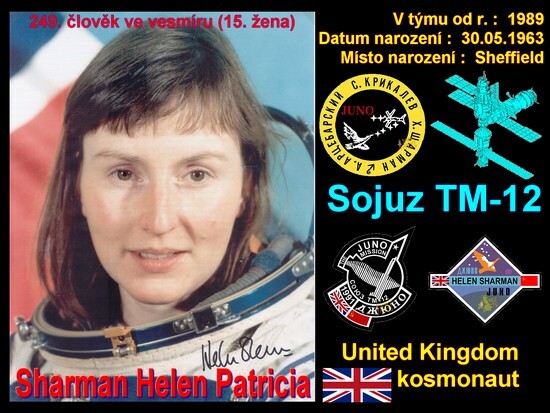 British chemist Dr Helen Patricia Sharman visited the Mir space station in 1991, as part of Project Juno, a private sector arrangement between the Soviet Union and a group of British companies. But the latest venture, with the publicly funded Peake, a current European Space Agency (ESA) astronaut, has served as the jumping off point for a number of distinctly private sector initiatives. As outlined in the December 13th, 2015 UK government press release, "National Space Policy: science fiction into science fact," the new policy is specifically designed to support "the Government’s new investments in areas such as human spaceflight and microgravity research as space becomes an increasingly essential part of our daily lives..."
In that way, and as outlined in the November 26th, 2015 post, "Say Hello to the New US Commercial Space Launch Competitiveness Act," recent American legislation has essentially attempted to acknowledge and encourage pretty much the same thing, while using a slightly different methodology. Will Canada ever get around to developing the same sort of useful policy? The Canadian Space Conference: When Will It Be Loved? Linda Ronstadt sings "When Will I Be Loved." Photo c/o Capitol Records. A hit song from the 1960's, and again in the 1970's, “When Will I Be Loved,” could be the theme song of the Canadian Space Conference (CSC). I've been cheated, been mistreated. When will I be loved. I've been put down, I've been pushed 'round. When will I be loved. The CSC was created by the former Conservative government as a forum for people from industry, academia and government to discuss space issues and plan for the future. It hasn’t fared well in its short two-year existence. As outlined in the February 26, 2014 CTV News article,“What happened at Canada's first annual space conference?,” the 2014 conference wasn’t exactly a barn-burner. About 100 stakeholders got together to discuss Canada's space policy framework, the government’s plan for the space industry that had been released by then Industry Minister James Moore a few weeks before. Other than a couple of articles in the media (the CTV article from Canadian Press and the February 27th, 2014 post, “The ‘Casablanca’ of Space Conferences!”) there wasn’t much public information about it. Screen shot of the CSA Upcoming Special Events webpage taken on December 13th, 2015 and showing the current "to be determined" status for the CSC. The conference was originally scheduled for April 2015. Screenshot c/o CSA. As reported in the April 19, 2015 article, “Our Space Agency Dreams of Going to Infinity and Beyond!!!! !,” the original conference date was postponed from April to June 2015, and then put on hold. Since it’s now December, the only way to have a conference in 2015 would be to hold it on Mars, where a year is 687 Earth days. Then again, another reason may be in play. The government (should) establish a Canadian Space Advisory Council, reporting to the Minister of Industry, with membership from industry, the research and academic communities, provinces and territories, and federal departments and agencies. The Canadian Space Conference was a Conservative government initiative. New governments like a clean slate. The space advisory council would be a fresh start that Minister of Innovation, Science and Economic Development Navdeep Bains, can put his own stamp on. Another event which has seemingly gone the way of the dodo is the John H. Chapman Award of Excellence. As outlined in the April 30th, 2012 post, "Space Advocates Connecting the Dots," the award was traditionally presented at the Canadian Astronautics and Space Institute (CASI) annual conference, where CSA past president William "Mac" Evans received the final prize from then current CSA president Steve MacLean in April 2012. Since then, no further trophies have been presented, although at one time the event was supposed to have been included as part of the postponed 2015 CSC. As outlined on the CSA awards website, "the next John H. Chapman Award of Excellence Award (sic) will be awarded at a date to be determined." If nothing else, someone at CSA headquarters sure needs a copy editor. Graphic and photo c/o CSA. I am aware of the work that the Association (Aerospace Industries Association of Canada) and its members did with Mr. Emerson on the Review of Aerospace and Space Policies and Programs. The CSC was a one-day event shrouded in secrecy. The word "council" as used in the Emerson Report suggests an ongoing dialogue, which fits in with the Liberals' promised strategy of inclusiveness and consultation. The Liberal government can continue implementing the Emerson recommendations, make the council more inclusive and open than the CSC was, and claim it as all theirs. Better than what those other guys did. Poor Canadian Space Conference. When will you be loved? If the Canadian Space Advisory Council is on the minister’s agenda, the answer to that question is never. The romance is already over. It's big in Hawaii, but in Canada, the story seems to be relegated to the bottom of the news cycle. This is a shame, because our last Federal government committed several hundred million dollars to its construction, and our current one will likely be on the hook for several hundreds of millions more to cover the costs associated with the inevitable delays resulting from this latest setback. 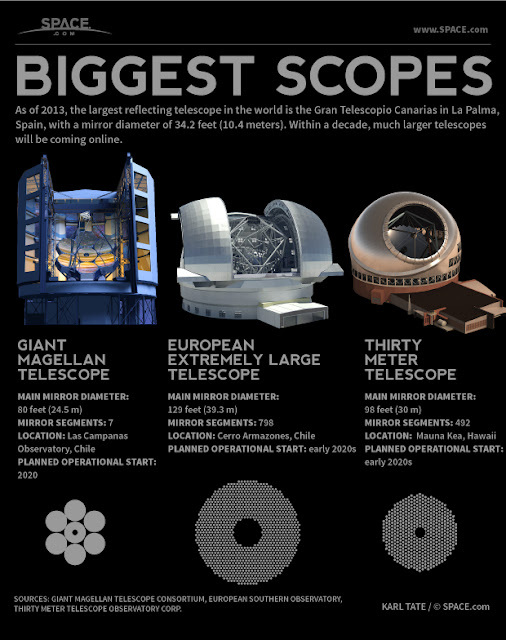 There's big money in large telescopes and the TMT (on the right, above) is only one of three new and extremely large telescopes, expected to be built over the next ten years. As outlined on the Giant Magellan Telescope (GMT) partners website, GMT partners include Astronomy Australia,the Carnegie Institution for Science, Harvard University, the Korea Astronomy and Space Science Institute (KASI), the São Paulo Research Foundation (FAPESP), the Smithsonian Institution, the University of Texas at Austin, Texas A&M University, the University of Arizona and the University of Chicago. The European Organisation for Astronomical Research in the Southern Hemisphere (ESO), is an inter-governmental organisation supported by 16 member states, along with the host state of Chile. The Thirty Meter Telescope Observation Corporation partners include the California Institute of Technology, the Department of Science and Technology of India, the Chinese Academy of Sciences (CAS), National Institutes of Natural Sciences/National Astronomical Observatory and the National Astronomical Observatory of Japan (NAOJ), the National Research Council (NRC) of Canada and the University of California. Each of the three organizations insists that their particular project is needed to maintain the high academic reputations currently enjoyed by their academic partners and the ongoing funding which normally accrues as a result of this reputation. Info-graphic c/o Space.com. As outlined in the December 3rd, 2015 New York Times post, "Hawaii Court Rescinds Permit to Build Thirty Meter Telescope," the Hawaiian state supreme court has rescinded the construction permit for the Thirty Meter Telescope (TMT), a $1.4Bln USD observatory planned for the state’s tallest mountain, the 33,000 foot tall Mauna Kea, a revered symbol in Hawaiian culture. Opponents of the project have contended that the planned telescope, which at 18 stories high would be the biggest building on the Big Island, is industrial development and would violate the rules for such zones. In 2005, a court-ordered environmental impact statement concluded that 30 years of astronomy had had an adverse effect on nature and culture on the mountain. The planned TMT, isn't the only observatory in the area. As outlined in the November 19th, 2015 Business Intelligence article, "This giant telescope will taint sacred land. Here's why we should build it anyway," there are already thirteen other space telescopes on the summit of Mauna Kea, and they are there mostly because the University of Hawaii deemed the place to be a reserve for astronomy in the 1960's in the aftermath of a tsunami that swept over the city in 1960. Mauna Kea is home to the largest concentration of telescopes in the northern hemisphere, and includes almost a dozen optical, near-infrared, sub-millimeter and radio telescopes. These include the United Kingdom Infared Telescope (UKIRT), the Canada France Hawaii telescope, the NASA Infrared Facility (IRTF) and the two Keck 10-metre telescopes. Photo c/o the Institute of Astronomy at the University of Hawaii. TMT will pay $1Mln USD ($1.34Mln CDN) per year for its space on the summit. Hawaii’s Mauna Kea Management group is tasked with preserving and protecting the mountain, and it will get 80% of the rent. The remaining 20% will go to the Office of Hawaiian Affairs that works to improve the well-being of native Hawaiians. TMT has committed to a $1Mln USD per year ($1.34Mln CDN) community benefit package. This will go toward a STEM-education program for Hawaiian students called the THINK fund. TMT has already started contributing to this fund. TMT is also setting up an annual $Mln 1USD ($1.34 CDN) fund to help funnel local Hawaiians into observatory jobs. Called the Workforce Pipeline Program, it will partner with local colleges and the Department of Education to create training programs, internships, and summer jobs for the kinds of engineering and tech positions required to operate and maintain the telescope. As outlined on the Canada and the 30 meter telescope website, the instruments will be used to identify the wonders of our universe. A report released in 2000 under the title, "The Origins of Structures in the Universe," identified the TMT as the ‘highest priority project,’ for Canadian astronomers. Graphic c/o Canada and the Thirty Metre Telescope. Should the program ever move forward the 30 meter telescope is "set to alter Canadian astronomy," at least as outlined in the April 7th, 2015 Globe and Mail post, "Thirty Meter Telescope project set to alter Canadian astronomy." According to the article the Stephen Harper conservative government had committed to spending $243.5Mln CDN on the TMT. But after the latest round of adventures, more funding will certainly be needed. The final decision on the TMT and Mauna Kea will likely take time to set up. Whether or not it moves forward is an interesting question that won't be answered any time soon. Henry Stewart is the pseudonym for a Toronto based aerospace writer. On November 24th, Blue Origin announced that it had successfully launched its New Shepard suborbital vehicle 100 km to the edge of space and landed it safely back on Earth. Though the launch marks a key milestone for both the NewSpace industry and spaceflight in general, reactions to it have been mixed. These reactions highlight fundamental differences between the NewSpace industry and old-style space advocacy. "400 very happy rocket scientists" watch the landing of the Blue Origin first stage at Blue Origin HQ on November 23th, 2015. Screen shot and video c/o Blue Origin. Built by Blue Origin, the Washington-based firm begun by Amazon.com founder Jeff Bezos, the New Shepard is a vertical-takeoff, vertical-landing (VTVL) reusable rocket intended for suborbital space tourist flights as well as suborbital science payloads. The New Shepard vehicle is named in honour of the first US astronaut to reach space, Alan Shepard. Founded in 2000, Blue Origin was a dark horse for the first decade of its existence, but has steadily grown into a powerful rival to the NewSpace industry’s current champion, SpaceX. In 2013, Blue Origin attempted to block SpaceX’s leasing of Kennedy Space Center’s historic Launch Pad 39A (the launch point for the Apollo moon missions as well as the Space Shuttles). Though SpaceX was eventually granted the lease in 2014, Blue Origin announced in September 2015 that it had been granted a lease for launch facilities at the nearby Cape Canaveral Air Force Station. In September 2014, following the ancient formula of ‘The enemy of my enemy is my friend,’ Blue Origin entered into a partnership with SpaceX arch-rival United Launch Alliance (ULA). Under the terms of the partnership, Blue Origin will produce its BE-4 engines for use in ULA’s announced competitor to SpaceX’s Falcon rockets, the Vulcan. Here's the real difference between the Blue Origin New Sheppard and SpaceX Falcon-9 rockets As outlined in the November 24th, 2015 Business Insider article, "There's a major difference between SpaceX and Blue Origin that makes them incomparable," they're designed for two different purposes. New Shepard is a one stage rocket which can generate approximately 110,000 pounds of thrust and is optimized for suborbital launch and first stage soft landing and reuse. The latest Falcon 9 rocket is a two stage vehicle which can generate 1.3 million pounds of thrust and is optimized for launching satellites into orbit, but not for landing and reuse of the first stage. It's worth noting that both companies are working on what the other is already capable of doing. 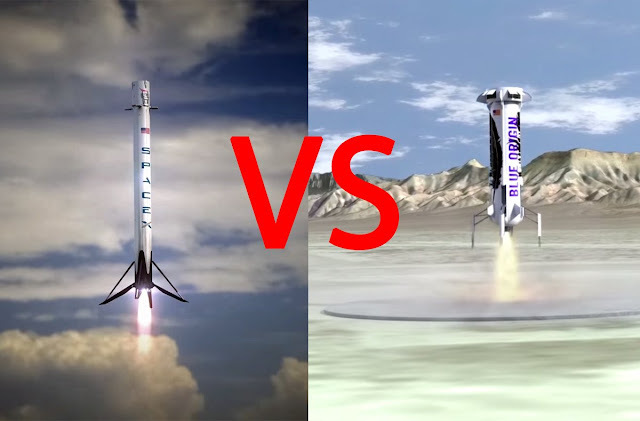 Graphic c/o Business Insider using screen grabs from SpaceX and Blue Origin YouTube videos. Reaching suborbital space (as the New Sheppard did) and achieving Earth orbit (as SpaceX’s Falcon rockets do) are two different things, the latter requiring vastly greater speeds (and so, more fuel) as well as posing different engineering challenges. SpaceX’s Falcon rockets achieved suborbital vertical take-off and landing (VTOL) in 2013 and orbital VTOL in 2014. Musk’s arguments, while technically correct, do not change the fact that Blue Origin’s vehicle landed successfully while SpaceX’s own vertical landing attempts have fallen just short of success. Musk, no doubt bitter at being upstaged, is rumoured to be planning a counterattack later this month. According to the December 1st, 2015 Space.com article, "SpaceX May Try Land-Based Rocket Landing This Month, NASA Official Says," SpaceX may move up its next attempt at vertical launch and landing to later this month. The official also said that SpaceX, doubtless trying to stack the deck in its favour, will aim to land its rocket on land rather than the sea-based drone ship used in its last attempt. Elon Musk and Jeff Bezos aren't the only eccentric, rich inventors who ever disagreed publicly and tried to make money off their differences. As outlined in the August 1st, 2011 Space Review article, "VASIMR and a new war of the currents," we’ve been here many times before, most memorably during the great “war of the currents” beginning in the 1880s. 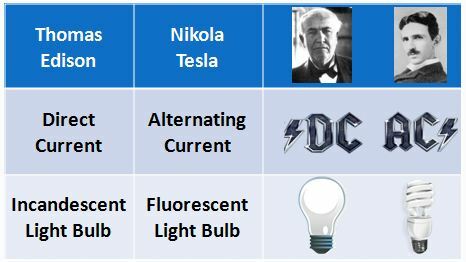 This battle over the future shape of the then embryonic electrical industry pitted American entrepreneur George Westinghouse and the eccentric but gifted inventor Nikola Tesla against Thomas Edison and his direct current technology Graphic c/o Topicalsquable. Reactions from space advocates on Facebook and various websites has been mixed, with many agreeing that the New Sheppard’s landing is unimportant since it was ‘only’ suborbital. Some have taken it a step further, saying that both SpaceX and Blue Origin’s vehicles are simply rehashes of the McDonnell Douglas DC-X (aka Delta Clipper) spacecraft of the 1990s and so NASA itself should be developing the technology rather than private firms. Such nitpicking and doctrinal squabbling among space advocates is nothing new. In the four or so decades of its existence, space advocacy has been rent by many schisms; the Moon vs Mars, solid versus liquid fuels, government-funded versus privately funded space programs, space-as-pristine-scientific-realm versus space development. These schisms have done much to keep the space advocacy movement tiny, incoherent and inconsequential. Among the entrepreneurs of the NewSpace industry, however, such bickering and one-upsmanship can move things forward by spurring the drive to achieve. Like the railroad tycoons of old, this clashing of egos will lay the foundations of the future.